The 21st century requires a different kind of support that does not disincentivize or doesn’t do so as much. A UBI will grow only 0.9% with the growth of citizenry, and while there will still be a need for a lower level of unemployment benefits, it should not be enough (close to half) to keep people from looking for a job. The UBI will also increase with inflation, but GDP is also adjusted for inflation. 0.9% should be easy for the economy to beat (the Mitchell Rule). Increases in current support levels for the zillions of programs are like whack-a-mole. You stop one and another increases. Better that you have one potentially federal budget busting increase to track and halt, while you let states do as they wish based on their liberal or conservative bias. 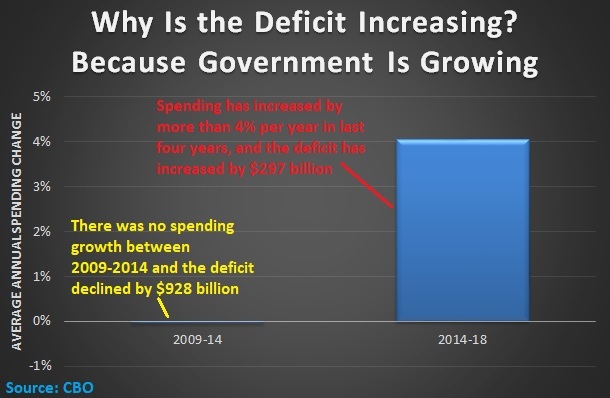 If the deficit was $782Billion ($0.782Trillion), how come we borrowed $1.17Trillion in FY 2018. A difference of $0.39 Trillion or $390 Billion dollars. And where, or on what was that $390 Billion spent on. My suspicion is it went to SS and or Medicare, but no one ever talks about this off budget and unauthorized spending..
Hopefully Dan, one day you will enlighten us on this question….